In the last week we've seen news on exploding fake Nokia batteries in India. According to The Indian Cellular Association more than 75% of the cell phone batteries sold in India are fakes. Even more disturbing was this news clip of Taiwanese brand chocolates that turned out to be counterfeits that had a filling of moth larvae. [warning: not for the squeamish]. 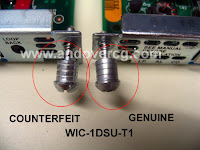 Finally, a new term: Chisco - which refers to the ever-increasing appearance of counterfeit Cisco equipment from China. This article gives a convenient "how to spot a fake" guide.